Located roughly 100 kilometers off the coast of Northwestern Africa this Spanish archipelago is among one of the best places we have been to! Our first stop via WOW Airlines was to the beautiful island of Tenerife. The Canary Islands are unlike any place we have ever been with all that there was to see and do all on one island. 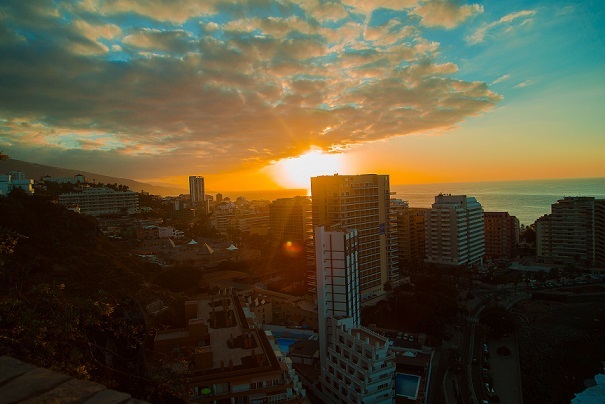 Tenerife is the largest and most visited of the Canary Islands and home to a melting pot of Brits, Germans, Scandinavians and of course Spanish tourists from the mainland. With the new flight path offered by WOW Airline, it is highly likely more American and Canadian tourists will soon be exposed to one of the greatest islands in the world. A tourist’s dream come true, you will never find yourself bored here. You literally could spend every minute of every day trying new adventures during your trip and never even come close to conquering the entire island of Tenerife in one visit. It is for great reason that over 5 million tourists visit the island every year. With numerous micro-climates and endless fun in the sun, Tenerife holds its own against any exotic island in the world! It definitely helps to have a vehicle, so grab a rental via AutoEurope.com and get ready to explore as much of the island as possible. LATM Tip: Take advantage of a WOW Stopover when you book your flight to Tenerife from Los Angeles and enjoy a stay along the way in Iceland, one the most exciting countries in the world. WOW air’s stopover option gives you the chance to break up long-haul journeys across the Atlantic. The WOW Stopover is available to book on return flights between North America and Europe via Iceland in either direction. To book your #wowstopover visit wowair.us. If you are an animal lover than a stop at Loro Parque is an absolute must! Located on the outskirts of Puerto de la Cruz on Tenerife the park was originally designed to be a massive bird sanctuary for its amazing collection of beautiful parrots from all over the globe. Today it has evolved into so much more and become one of the best zoos in the world. We were enamored by the endless amounts of stunning birds ranging from South America to Australia; it was impressive to see how many species of birds actually inhabit this earth. Due to its subtropical latitude and a natural cold current from the surrounding Atlantic Ocean, there are near perfect conditions for the parrots to not only have a great life but also a setting ideal for breeding. The conservation efforts at Loro Parque are mind-boggling, to say the least; after a behind the scenes tour we were quite taken aback by the effort the park puts into saving species of exotic birds, penguins and other species of animals in areas where extinction is inevitable. If birds are not your cup of tea, there are plenty of animals to spend the day viewing including silverback gorillas, lions, tigers, orcas and an exciting dolphin show that takes place in the largest dolphin pool in Europe! If you are a big kid at heart and love waterslides Siam Park should be right at the top of your list of things to do while in Tenerife. 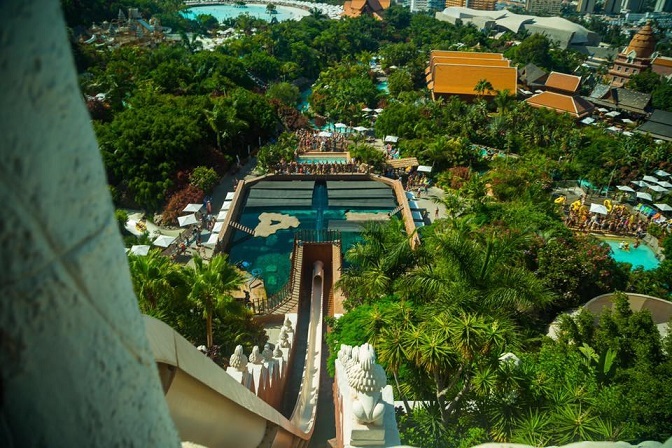 Since opening in 2008 this tropical wonderland has been voted the best Water Park in the world many times over. We have to admit waterparks are one of the last places we spend time at when visiting a new area. Most waterparks we’ve visited are crowded, loud and contain long lines with burning hot cement under your feet. Siam is the complete opposite; this Thailand themed refreshing destination has been designed to provide comfort, luxury and thrill-seeking all rolled into one! The waterslides are a blast highlighting just the perfect combination of fun-filled fear and rip-roaring excitement that makes you want to get right back on the ride the second you get off. Rides like the Dragon, Mekong Rapids, Volcano and the newly added Singha will take you on the ride of a lifetime. The highlight of the park is definitely the Tower of Power which is a straight vertical drop (one of the highest slides in the world) that takes you inside a tunnel surrounded by sharks! If you’re not a thrill seeker the park offers a massive wave pool with a white sandy beach where you can spend the day relaxing with friends. If you have the need for a little more of an intimate experience book one of the bungalows available that are tucked out of sight for maximum privacy while enjoying the park. The number one thing to do when visiting Tenerife is paying a visit to one of the great wonders of the world, Teide National Park. Mount Teide is the third highest volcanic structure in the world and naturally, it is the highest peak in all of Spain. Spend the day hiking the unique landscape of craters, volcanoes and rivers of petrified lava which surround the impressive Teide Volcano sitting at 3,718 m. above sea level. Take the cable car up to the top of the volcano for impressive photos and top-notch hiking but beware the elevation up here may take your breath away if the view hasn’t already done so! Glide over this geological gem where volcanoes, craters and lava flows forming an impressive palette of colors and volcanic shapes you won’t find anywhere else. 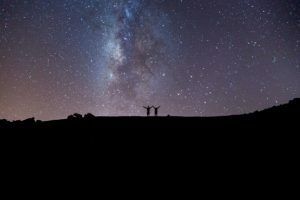 The icing on the cake for the day at Tiede National Park is the phenomenal stargazing at night! Tenerife is among the top 3 places in the world to view the stars at night due to its phenomenal conditions. The peaks of the island, away from the light pollution of urban areas make for the ultimate clear skies to be able to see the Milky Way, the 88 different constellations and endless shooting stars! Set in Teide National Park, Parador Nacional las Cañadas del Teide is a casual lodging option just a short walk from the Roque Cinchado rock formation and 11 km from Mount Teide volcano. The property hosts an elegant restaurant with a stone fireplace and mountain views, plus an airy bar and a cozy lounge. Secure a dining reservation prior to the Stargazing experience for a truly unforgettable evening. It truly is difficult to top a beautiful day on the water with crystal clear blue skies while sunbathing on the bow of a luxury sailboat charter off the coast of Tenerife. As the sailboat leaves the marina the view of the Tenerife mountainside is absolutely exhilarating and as you pull out of the harbor the ocean comes alive! Literally 15 minutes after our departure the boat was surrounded by dolphins and pilot whales frolicking in the bright blue sea. Sip Champagne and toast to the good life while listening to the music as you tan the day away. Stop and anchor to fit in a snorkeling session with sea turtles or make sand angels on one of the islands top beaches. Big Smile ensures the perfect vacation day out at sea and trust us, they are the best at what they do! If you are a true wine lover there is nothing better than visiting a winery that is homegrown from local, passionate wine growers that live and die for their profession. Suertes del Marqués is a family winery, which started producing wines in 2006. They had been selling their grapes to another winery for twenty years before they decided it was time to become one of the main growers and producers on the island. 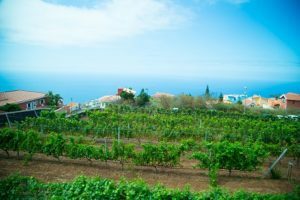 Located on the north side which is ideal for grape harvesting and wine production the family stays true to their roots and pulls no punches when it comes to producing some of the best wines the Canary Islands have to offer. With a great respect for tradition, the philosophy of Suertes del Marqués is to artificially interfere as little as possible in the development of their wines which is purely evident in the quality of their harvest. All processes are carried out manually and if you ever have the chance to visit the property it will give you a whole new respect for the art of winemaking and the people behind the scenes that live and breathe their delicate craft. When you’re in the mood for learning all about great Spanish wines what better place to go then the Tenerife Wine Museum. Here you will get educated and explore the passion local Canarians have for the art of winemaking. Delight the taste buds with some of their award-winning cheeses paired with fine wines from the island. While touring the historic site make sure to save room for lunch at their fabulous cliffside restaurant. Enjoy local Canarian small plates, cheese platters and more local wines all whilst gazing out into the shimmering blue ocean waters. What would a trip to Spain be without taking in some cultural entertainment at its finest? In the coastal town of Arona, you will find one of the top Flamenco shows in the world! The show features a compilation of the choreographies by Carmen Mota Compañía de Danza. After almost 40 years she has evolved her show into a greatest hits rendition of her illustrious career featuring some of the most talented singers and dancers in Spain. Tradition and modernity are blended perfectly together to demonstrate the evolution of the Flamenco artistic culture in Antología. Presented in one of the largest auditoriums in Europe this 1800 person capacity theater absolutely comes alive when the beautiful art of Flamenco is showcased on the highest level imagined! With such an array of new and trendy restaurants to choose from it can be a breath of fresh air to dine at a restaurant that offers a mix of Tenerife history, nightly entertainment and delicious traditional cuisine! Molino Blanco features Canarian and Spanish dishes including paella, Galician style octopus, garlic prawns, carne fiesta (marinated pork) and mouthwatering steaks! The restaurant showcases an extensive wine list of local and Spanish mainland wines and a singing Chef that sets the tone for a perfect night on the town. Looking for an ideal place to see the full European day and nightclub experience? Look no further than Papagayo Beach Club for its uber-trendy take on Ibiza style. Offering electronic dance music, vibrant cocktails and Canarian cuisine this is the place to spend with friends on an unforgettable evening. Modern white décor, private lounge areas all with a gentle Atlantic breeze and a perfectly concocted Mojito make this establishment popular with locals and tourists alike. What more could you ask for? Don’t miss the venues special events where they bring in world class DJ’s while you take in possibly the best place to view the sunset in all of Tenerife! As one can imagine seafood is a large part of Canarian cuisine, freshly caught every day and delivered right off the boats to many amazing seaside restaurants of Tenerife. With all these top-notch choices of stellar coastal dining experiences, how does one pick the perfect place to try? Our hotel concierge pointed us to a little seaside village named La Caleta which was dotted with several restaurants and now the hard part was which one to choose. We spoke with a few locals and Masia del Mar seemed to come up several times. After experiencing it for ourselves we were more than pleased with their recommendation. The seaside dining experience offered fabulous view alongside fresh and hearty cuisine. Opened in 1981, Masia del Mar has been a staple of La Caleta feeding locals and tourists alike. Freshly caught seafood is brought to your table with impeccable presentation and paired with a bottle of Spain’s finest wine makes for the ultimate Canarian dining experience. For the best steak in the Canary Islands and an absolute first class dining experience, Brunellis steakhouse is a stopover that simply cannot be missed! If you’re a local you know the last name Kiessling well (The owners of Loro Parque and Siam Park). When you hear that they are introducing an American style steakhouse to the islands dining choices you know it’s going to be top notch as everything the family produces is the best of the best. 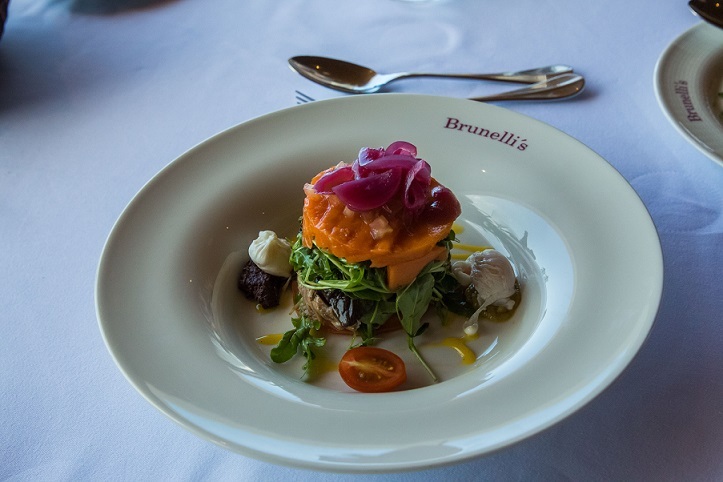 Recently opened Brunelli’s has quickly become the talk of the town with its extremely high-quality dining experience set over the ocean literally a stone’s throw off the main dining room. If you are lucky enough to sit at a table next to the window you will get the first class treatment of having the entire window raise up and disappear allowing the refreshing ocean breeze to carouse over your table and provide a view you will never forget. Paired with some of the highest quality of meats ranging from Argentina to Australia, Uruguay and back to Spain your choice of steak is world class. Add a bottle of Spain’s finest wine and you will soon see why Brunelli’s is among the top steakhouses in the country. The Gran Hotel Bahía del Duque is luxury at its finest and this is seen from the moment you pull into the gate. The staff greets you as if you were one of their own and your bags are instantly whisked away and replaced with a welcome glass of bubbly to kick off your stay. As you sit in the hotel lobby bar meeting with your host you can’t help but be drawn to the beautiful exotic birds that fill the ground floor. It is at this time that you realize that you have made it to the Canary Islands and your stress level instantly disappears. After your tour of the grounds plunge into one of the many inviting pools on property or take a dip into the gorgeous blue waters of the Atlantic Ocean a few steps away. The resort offers a perfect mixture of luxury and tradition while displaying a strong colonial style in the design as well as the clothing of the personnel, inspired from the tradition of the Canarian lifestyle to make you feel like you are a welcomed guest in their home. The resorts culinary staff prides themselves on presenting a variety of cuisine so guests have numerous options during their stay. With 8 restaurants to choose from ranging from Italian, Asian and of course local Canarian cuisine you will never run out of choices to dine on property. There truly is very little reason to leave the resort during your stay, with an abundance of activities including tennis, top-notch fitness facilities, a billiards room, squash court, two paddle courts, pitch & putt, botanical walk, ping pong and an astronomic observatory. Luxury and seclusion all rolled into one. If you are searching for a place to call home during your stay in Tenerife and want to be away from it all you couldn’t ask for a better place. The Royal Garden Villas & Spa take intimacy to the next level with meticulously groomed grounds and comfortable living quarters that include all of the amenities of a 5-star resort. 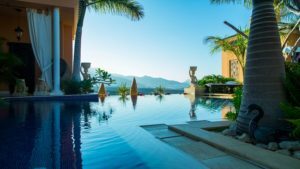 Each villa comes with your very own plunge pool and with golf course views you will find yourself spending endless hours just gazing out at the amazing backdrop. The Villas are built into a hillside and each one provides complete privacy. Trickling fountains, Spanish décor, tropical foliage all grace the common areas and unveil a fairy-tale setting. Take a plunge into the resorts main infinity pool while sipping cocktails with friends or simply spend time reading on your own terrace with luscious mountain views to your left and the blue Atlantic Ocean to your right. It simply doesn’t get better than this! Breakfast on property is five stars in itself with a fantastic array of delectable bites and savory dishes. Mimosas, omelets to order and a dessert assortment complete the complimentary breakfast experience, so don’t miss out during your stay. After a quick and smooth ride with Fred Olsen Ferries, we had arrived at the second largest most populous of the Canary Islands, Gran Canaria. Lucky for us we had a car thanks to AutoEurope.com which made things really seamless when island hopping. For just a small amount more you can cross islands with a vehicle which makes life that much easier and you don’t have to worry about getting transportation from the port of Santa Cruz to your hotel. For a much more relaxed stay away from the faster paced of Tenerife, Gran Canaria offers a traditional feel to add to your Spanish Island adventures. We found two nights were enough to stay and get a good taste of the island. Tenerife was certainly more our style but it was a nice break to up our time and experience a different side to the Canary Islands. 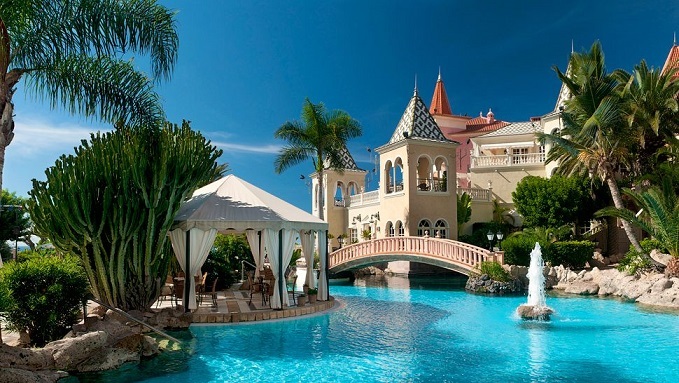 This 5-star luxury property offers everything you will need for an ideal Gran Canaria stay. This palm tree oasis is exactly what the doctor ordered to relax your days away. Spend the day lounging at one of the refreshing pools, play some ping pong or shuffleboard or even try a session of yoga or Tai chi! After a day of activities, it is only natural that you will build up quite an appetite and there is no need to leave the property. The hotel offers multiple dining options and most bookings come included with half board (Breakfast & Dinner included). Enjoy savory meals in two first-class restaurants and the African Bar, all offering top-level wines and fine cuisine at the highest level. The main restaurant serves a variety of a la carte fare from all over the world as well as themed buffets and barbecues, also on property you will have a choice of Mediterranean specialties from Esencia or maybe you’re in the mood for tapas at La Bodega the Spanish themed restaurant. Carouse through the luxurious grounds surrounded by palm trees leaving your cares far away from the rest of the world. The hotel is centrally located to many outside activities and surrounding tourist attractions. Merely steps away are the famous dunes of Maspalomas where you can ride a camel for the day or walk the five-mile stretch of sandy beach right in front of the hotel. The restaurant at the Seaside Grand Hotel Residencia is among the top restaurants in all of Gran Canaria. 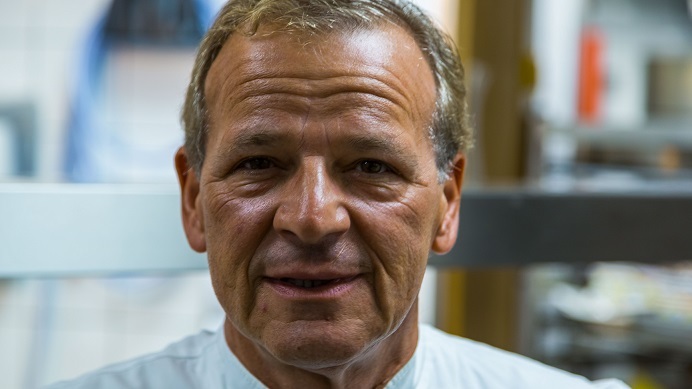 Led by Michelin star chef Wolfgang Grobauer the restaurant presents upscale Canarian style cuisine paired with an extensive wine list from the islands as well as mainland Spain. The dishes are delicately presented with artistic flair so much that you’re not sure if you should eat your food or just admire it! Since Spain is world famous for its seafood, meats and paellas you can imagine the delectable plates that are served up by Chef Grobauer. You can’t go wrong with the Tartar of Red Sea Bream, their signature Gazpacho or the Entrecote Double of Austrian Beef. The Risotto is also a crowd pleaser as the creaminess of each bite melts in your mouth. It is easy to see why Chef Grobauer is making quite a name for himself on the island. Our dining experience with him was definitely a highlight of the trip and our most memorable meal. This entry was posted in Destinations, Editor Picks and tagged canary islands, gran canaria, spain, tenerife, travel.